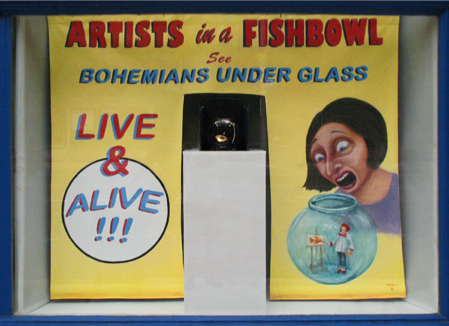 Using the sideshow illusion Girl in a Fishbowl as a point of departure, Artists in a Fishbowl allows a peek into what goes on inside the artists' studio by means of arcane carnival trickery and contemporary technology. 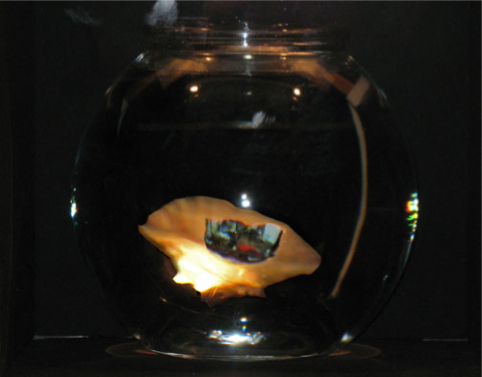 Submerged within a fishbowl is a sea shell, inside of which is the miniaturized studio of WeSee Inc. Sometimes dark and quiet but often the lights come on and the underwater studio comes alive with aquatic artistic activity. Often as not the physicality of creative functions is interrupted by pauses for critical thinking; the scratching of tiny heads; tiny coffee breaks; occasional interruptions by tiny aqua-cats; and the various other mundanities that tiny submerged artists do in their daily lives.